Q: I am 31 years old and an on/off again treadmill runner/jogger. I tried to start running outside but it made my knees hurt too bad so I have to resume treadmill running. I know the importance of strength training and actually love lifting weights and body weight exercises. My question is this: I love how lunges make my thighs get firm but lately they are hurting my knees and now when I walk down stairs my knees speak to me. Yes, I am a bit heavy but I don’t want to give up exercise! I want to save my knees as I hope to get many more years out of them. I don’t have consistent exercise to a pool so can you suggest any leg strengthening exercises that won’t hurt my knees? Any suggestions (other than lose weight) on how to save/strengthen my knees? Thanks Erika-this has really perplexed me and I’ve skipped working out because I’m scared for my knees. I always hate to hear someone say that they’re skipping a workout, especially out of “fear,” mainly because in a lot of instances, activity is what you need the most… just the right kind of activity. Whenever you’re experiencing joint pain, nine times out of ten it has to do with the way you’re moving, usually in either the thigh or the calves (or both.) As you move, all of your joints are supported by the adjacent muscles. When it comes to your major joints – shoulders, chest, pants, shoes…. uhh, I mean hips, knees, ankles (purposefully leaving out shoulders, fingers, toes, and wrists for the intentions of this post, but they are/have joints as well) – they tend to take quite a beating, and the beating only gets worse as you age particularly because many people are so sedentary throughout the day. “Creaky” joints are only a major concern when there is pain involved with the cracking. It’s usually a result of the same kind of mechanism that allows you to painlessly crack your knuckles, neck, or back. A sedentary person that would otherwise be less active, all of a sudden starts moving (or moving in new and different ways), and it’s safe to bet that your joints are going to protest a little bit. If you do experience pain, however, go see a joint specialist – it’s likely due to a loss of connective tissue, and that is where permanent damage can occur. 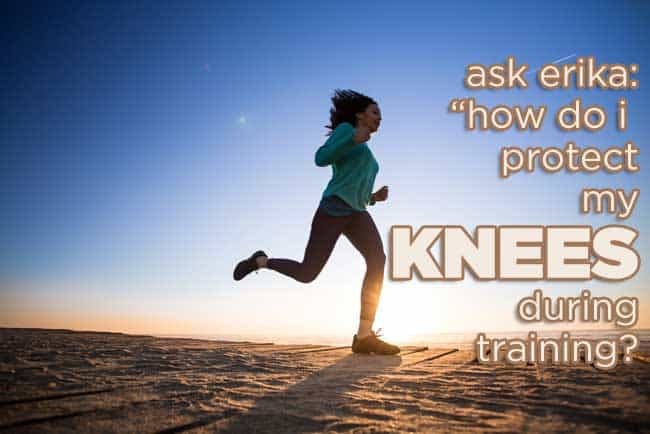 When it comes to identifying knee pain, take a long, hard look at your knee – is the pain directly on the joint, or is it just above or below? If it’s above or below, it’s related to the muscle groups responsible for the joint, not the joint itself, and it’s an easy fix. Treadmills aren’t quite the salve we think they are. They’re human hamster wheels – the terrain never changes, there’s never any opportunity for you to increase your own pace naturally, they have their times where they’re potentially dangerous, and they actually can de-condition your body for running outdoors. Treadmills allow you to get away with running on your heels and conditions you to be comfortable with that and, once you try to do that outdoors, you struggle. In other words, consistent treadmill running can make it harder for you to run outdoors. Long time runners will tell you – hell, I told you years ago – that you have to pick one: outdoors or treadmill. You cannot train equally on both, and outdoor running – regardless of the terrain – is infinitely better. Because the treadmill essentially bends to your movement, designed to make it easier for you to run no matter how you run, it enables you to run with poor form. When you’re outdoors, however, Mother Nature isn’t interested in your tomfoolery. The Earth does not cave to your heel striking – you land on that heel and, like a shockwave, the force moves up through all of your joints, through all of your muscle groups, eventually dissipating somewhere around your core. This is where that hip pain comes from. This is where that plantar fasciitis comes from. And, this is where that knee pain comes from. At the same time, that outdoor terrain is how your body changes – your legs get leaner because your muscles have to grow and change and move differently to support you better. As your muscles are more active, your calorie burn increases and improves. Your heart rate gets higher faster, and your heart gets stronger. Your time outdoors is more effective. You get the job done faster. Also, check out your running form. Kiss the treadmill goodbye – or, at least, no more running on it (walk/speed walk in intervals instead!) and definitely no training for events on it – and focus your genuine running outside, and use this as an opportunity to tighten up that form. It might mean you have to go slower, but that’s okay. Fast runners were slow runners (and, even walkers) once upon a time, too, so you don’t have to feel like you’ll never pick up speed or endurance. I’d also recommend a knee brace for the time being. Something is going awry in your legs, and it could be temporary or permanent. While you work to strengthen the muscles that support those joints and tighten that running form up, the knee brace will help you remain mindful of your movement – focusing your movement in the right direction, no knees going outward to the side instead of forward – and help you feel supported in your knee, thereby better strengthening your muscle groups. You don’t have to give up anything, but you do have to go slowly and take your time. When it comes to those sounds in your knee, pay close attention. I had this issue in the beginning, and it went away after a couple of months of consistent, but mindful training. If yours doesn’t, don’t be afraid to go see a specialist to get some insight – unattended knee pain can quickly turn into hip pain (because you’ll eventually start walking differently to avoid the knee pain, only aggravating the hips) and then you’ll really be up a creek. Stay consistent, stay conscious of your needs, and don’t be afraid to slow down or stop when your body fights it… and I promise, your knees will go back to giving you the silent treatment! I’m not nearly as knowledgeable about these things as you are, Erika, but one of the things that I’ve noticed in my own wogging (walk/jogging) journey is that I need regular alternate exercises so that my muscles don’t shorten due to the repetitive nature of walking/running. When I don’t do things like stretch regularly (I’m REALLY bad about that actually), incorporate yoga/Pilates, and strength train my legs (weighted leg lifts — adductors and abductors especially, as they’re usually not strengthened as much as hamstrings and quads when we train, and provide a counterbalance), I experience much more knee pain and knee fatigue, particularly when going up/down the stairs. Having been morbidly obese for decades, this is not unexpected for me–the pain, that is–as I also have arthritis, but it’s only been lately that I’ve been able to put together a regimen that addresses all the leg muscles more or less equally. What I like most about your response to this reader, though, is that you encourage continuing to move. This is why you ROCK…well, that and your truly amazing, epic fro! But you remind me of something else that I intended to include in the post – flexibility! I had the learn the hard way less is more. I’m a heavy person with arthritis in both knees. I started taking water aerobics years ago. It helped. My flexibility increased and my left knee stopped hurting all together. I was working out 4 days a week and all was well. Then I hit my stride. I started loosing weight and though I’d ramp things up. I started working out 6 days a week and I would put my all into each workout. Suddenly my right knee started hurting really bad. I thought I’d work through the pain. Then my back started hurting. I ended up having to chill for 2 weeks to make the pain go away. I’m allergic to NSAIDS so all I did was lie on a heating pad. I’ve since seen my ortho and pulled my workouts back down to 4 days. This was my question-you have no idea the thrill I felt seeing it answered! THANK YOU SO MUCH ERIKA! I truly had no idea what to do and it’s been two weeks since my last workout and I honestly miss it! Since I stopped exercising the knee pain went away and now I won’t worry about my “noisy” knee! I feel like God is trying to tell me something because this week my doctor advised I spend more time/effort on weight training and I will use your suggestions of using a ball to support myself. Because I really do love running outside especially due to this lovely weather I will slowly build my tolerance to it and base my progress on how my knees feel. Once again, thanks so much-you have no idea how much you’ve helped! Aw, thank you! Get out there and be active! When you use that exercise ball, you need to use it in a way that allows you to lean against the wall, alleviating some of the pressure you’ll be sending through your legs to your feet and lessening the amount of weight you put on your feet. I recommended a good, reliable, sturdy ball – it’s the one I own and have owned for years – so don’t be afraid to lean against it with as much weight as you need to. These aren’t the only exercises you can do, but these are the ones I recommend. Feel free to look for other ones, just be sure that you’re using the ball in a way where the ball is lessening the weight and pressure you put on your feet. And, if your doc told you to focus on weight training, then my initial thinking was right – get yourself a foam roller, too, and roll your quads/hamstrings and calves before you strength train, so that your muscles get the most out of what you’re training for. Your reply brought up a question I’ve had for a while, & even tho I feel bad for side-tracking the conversation, it just popped into mind & if I don’t get it out, I’ll forget. I’ve seen people at my gym using foam rollers all over the place. What exactly is their primary function? Is it stretching? Really embarrassed that, as much as I talk about foam rolling, I’ve never actually written a post dedicated to that. Let me fix that today. Thank you for answering this question. I found out this week that my mom has lost the cartilage in her knee and its bone on bone bow. They are suggesting surgery. This has prompted to me get real serious about my journey. I haven’t been consistent because my knee hurts sometimes and my plantar fasciitis has come back…..and I would stop working out. I’m glad I read this article because I have a ball and I’m going to invest in a foam roller as well. I know you swear by them. At this point, I’m willing to get it all a try to help me find my rhythm. I’m also considering a personal trainer. Any tips on finding a good one?? Thank you for posting the article again Erika! I knew you had written about it before but when I did a search on your site, the article you posted didn’t come up. I know that I’m looking for someone that is used to working with overweight/obese trainees but not into fat shaming and that’s what I got this week when I started asking around at my gym. The personal training “manager” told me I was obese and that I needed to do something about (like hurry up and sign a 12 month personal training contract) because of all my diseases/illnesses like high blood pressure. I told him I don’t have high blood pressure, diabetes, high cholesterol…..he told me….but you will. Needless to say I kept it moving. I’m not looking for handholding but guidance, direction and yes some encouragement would be nice also. Not fat shaming. The last time I checked….making someone feel bad about themselves does not prove to be a great motivator. Unfortunately, so much of running a successful personal training business is about sales, and so much of sales is about fear being a great motivator to get people to buy what you’re offering… some personal trainers are in a great position to tell you that you’re going to die if you don’t work with them. For winter running, is there a good alternative exercisd to the treadmill? I joined a gym in March just because the conditions here were horrendous (8 inches of ice on the sidewalks from Jan-Apr. And most of the streets). I ended up with a concussion trying to deal with it, which put me down for a month. Is there any place you can go in your area that will allow you a trail or pathway to get to that’s safe and well-maintained?